John grew up in Devon Congregationalism and was a teenage Church Treasurer. He was awarded a Senior Scholarship by King’s College, Cambridge, and received a First Class Honours degree in Economics. He worked for the Bank of England for twenty years: his diverse posts there included research on international debt issues and co-ordinating the Bank’s network of regional Agents. From 2000 until he was called to be Moderator he was employed by the Methodist Church. Initially he worked on the Church’s relationship with the worlds of business and economics and supported a network of over 100 workplace chaplains. He was then asked to set up and lead a Policy Unit to help Methodism think creatively about the longer term. After a major reorganisation in 2008, he was appointed as one of four Strategic Leaders in a role which involved leading the whole Methodist staff team. Committee 2002-2006 and led the process that produced the Equipping the Saints report. 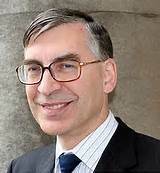 John is a Trustee of the Bible Society, and chairs the committee seeking to improve the diversity of its Board. With a three year term as Moderator, John hopes to be able to help the Church address some of the larger challenges it faces. These include how the Church’s Ministers of Word and Sacrament arebest deployed and how to ensure that those church buildings which the URC still needs feel like attractive assets not burdensome liabilities. Behind such issues is the more fundamental question of what patterns of church life will sustain and deepen the discipleship of existing members while also drawing new people towards vibrant Christian faith. also worked on business ethics more generally, not least as Adviser to the Governor of the Bank of England. John is also keenly interested in how the URC expresses its ecumenical commitment. In Kent he has led for the URC in a rural Local Ecumenical Partnership and helped plant an ecumenical church in a new housing development. Complementing his URC commitments, he has held positions of responsibility in Baptist, Methodist and Anglican contexts. John’s dream day off would include following a large fried breakfast with a trip up to London behind a steam locomotive to see England thrash Australia at Lord’s, and then celebrating in the evening with a concert of Mozart’s music played by an African youth orchestra.